v. : ; 22-28 cm. Ceased with Nov. or Dec. 1969. 200. 9 million during November 1964 according to the Crop Reporting Board. 12 percent from December 1, 1964.
decrease of 8 percent from the same months last year. The number of "egg type"
eggs in incubators on December 1 was 12 percent above the year earlier. 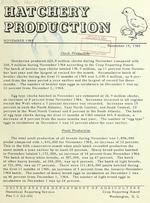 poults compared with 1,435,000 for November 1964, an increase of 32 percent. in November totaled 1,172,000, an increase of 35 percent from November 1964.
incubators on December 1 was up 24 percent. South Atlantic total includes Delaware, Maryland and West Virginia. West total includes Montana, Wyoming, New Mexico, Arizona and Nevada. 3/ South Atlantic total includes Delaware, Maryland and West Virginia. V West total includes Montana, Wyoming, New Mexico, Arizona and Nevada. : Thou. Thou. Thou. Thou. Thou. Thou. Thou. Thou. See footnotes on page 7. See footnote on page 7. Thou. Thou. Pct. Thou. Thou. Thou. Pct. Jersey Buff, Royal Palm and wild turkeys.